CostCo and I have an understanding. Every month or so, they send me a book of coupons, which I forget about until the Monday after they’ve expired and then I say something like “damnit, I’m going to remember to use these next time” and throw the coupon book in the recycling, and then the cycle repeats the next month. It’s worked out pretty well for us so far. That’s not entirely true, though, because I actually found the coupon book the day BEFORE it was going to expire a couple of months ago and immediately went to CostCo and bought $400 worth of stuff none of which was actually stuff for which I had any coupons. I also bought my wife a five pound container of Red Vines because she’d asked me, a few days before this trip, if I could pick her up some red licorice the next time I went to the store. You’d think, after fifteen years of marriage, that I’d remember that she didn’t like Red Vines. For the record, she’s a Twizzlers fan. So we have five pounds of Red Vines that I’m slowly eating. I’m banned from going to CostCo by myself in future, by the way. Anyway, they sent me another book of coupons, and before I got to the forgetting to use these until they expire step, I wanted to highlight one as being, well, very peculiar. 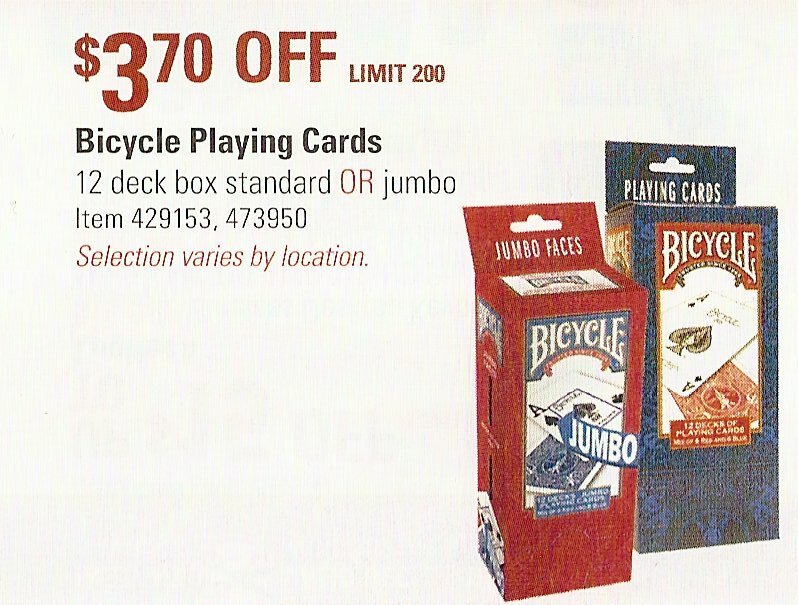 OK, so I can understand that someone might need a box of twelve packs of playing cards, that’s not the weird part. I’ve never personally been in the situation where I’ve needed that many playing cards, but what the hell. What confuses ME is the “Limit 200” part. I cannot fathom a situation in which anyone might actually need more than twenty-four-HUNDRED packs of playing cards, but apparently it’s enough of an issue that the folks at CostCo wanted to make it clear that, no, they DO have a limit. Pretty lame update for the first update in three weeks but it’s coming up on Finals week here and I’m going to use that as my excuse.